Never miss an issue of Scarlets official programme with the programme app for the 2015/16 season wherever you are in the world. You can make a season long subscription which includes all PRO12 games, ERCC games or make a one-off purchase. 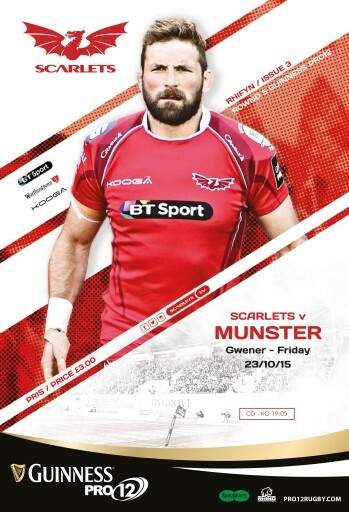 Official Matchday programme for the Guinness PRO12 game between Scarlets and Munster, Friday 23rd October, kick-off 19:05 at Parc y Scarlets. 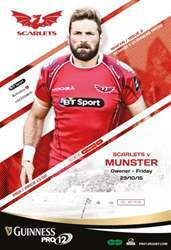 You'll receive 16 issues during a 1 year Scarlets Matchday Programme magazine subscription. You'll receive 16 issues during a 1 year Scarlets Matchday Programme magazine print subscription.